Ayza Wine and Chocolate Bar is one of the few options in the garment district for a classy quaff, and now the cacao-themed boîte takes on a very vino-saturated hood: the West Village. Opening next week, the second Ayza location will continue the original’s approachable wine list, flavored chocolate martinis, and savory small plates like “angry chicken lollipops” (in a spicy sesame-hoisin sauce). 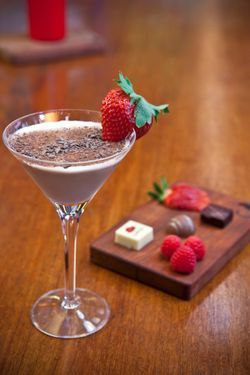 There’s a separate chocolate menu, too, with individually priced bites from the likes of Jacques Torres and Martine’s Chocolates. (See menus below.) New to downtown is a chocolate fountain accompanied by fresh fruit and other dippables, including Turkish delight and banana bread. Chocoholics and booze-aholics, this place sounds like your jam.